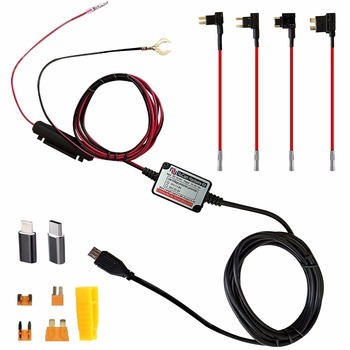 10ft hardwire kit for dash cameras and other devices that use Micro USB. Our new kit set comes with Low-Profile Mini, Mini, ATO(Regular), and Micro2 Fuse Adapters. Extra length hard wire with the most popular fuse types will meet the applications for most car models. Protect your battery: If your cars battery voltage drops to 11.6V/ 23.2V the regulator will cut off the power coming from the car battery. When car batteries are new, they're around 12.5 Volts or more. The regulator will monitor your car battery voltage level and cut the power when it gets to 11.6V. This leaves you with enough power to start your car and recharge the car battery. This Prevents battery over drainage. This hardwire kit is also suitable for 24V systems. Installation is easy and clean withough any help from professionals!